The TA Roloff range offers a wide array of options for modifying valve gear to the customer’s needs. If you do not wish to utilise these options and are looking for a simple 90° actuator (quarter turn) you might find what you are looking for with this brand. 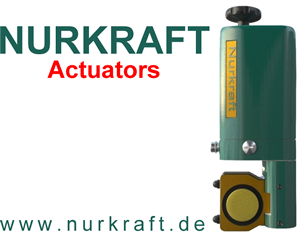 Nurkraft actuators are a traditional and effective alternative to the TA Roloff range for torques between 25 and 400Nm. The atypical construction of having the casing situated axially to the piping makes it ideal for cramped conditions.